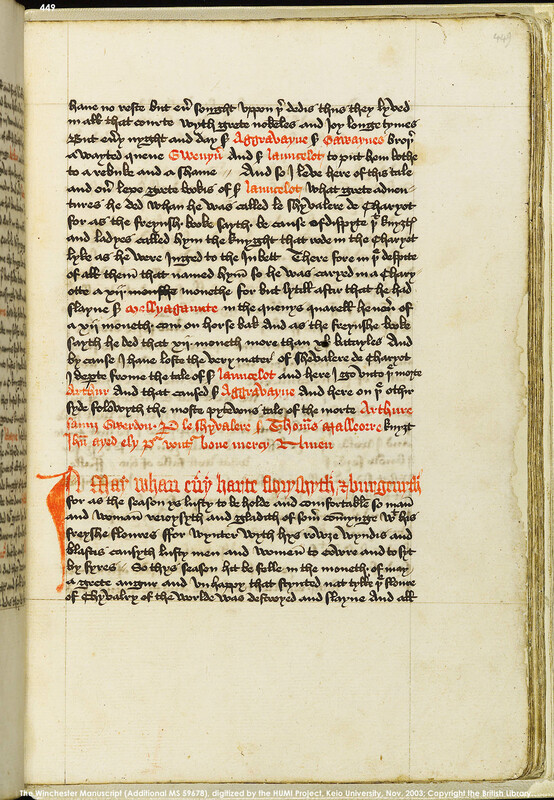 One of the major differences between Winchester and the Caxton is the system of textual divisions: the Winchester scribes divided it by explicits and incipits, and by large coloured initial letters, whereas Caxton divided the text into books and chapters. 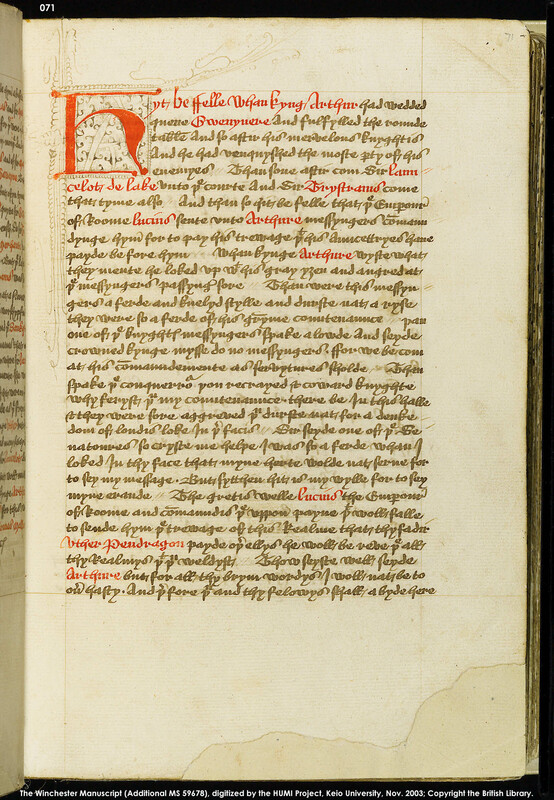 See, for example, the beginning of the Roman War episode in Winchester and the beginning of Caxton's Book V.
All except three textual divisions in Winchester correspond to Caxton's book or chapter divisions. The three textual divisions that do not correspond to each other appear in the Roman War episode. Search the Textual Divisions in Winchester and the Caxton. In the Winchester manuscript, which lacks two quires and a few leaves, 111 coloured initials remain, which serve to indicate textual divisions. The coloured initials in Winchester are usually in red and two- or three-line height, and they usually follow the previous section without leaving any space. See a typical two-line initial in Winchester: fol. 73r. 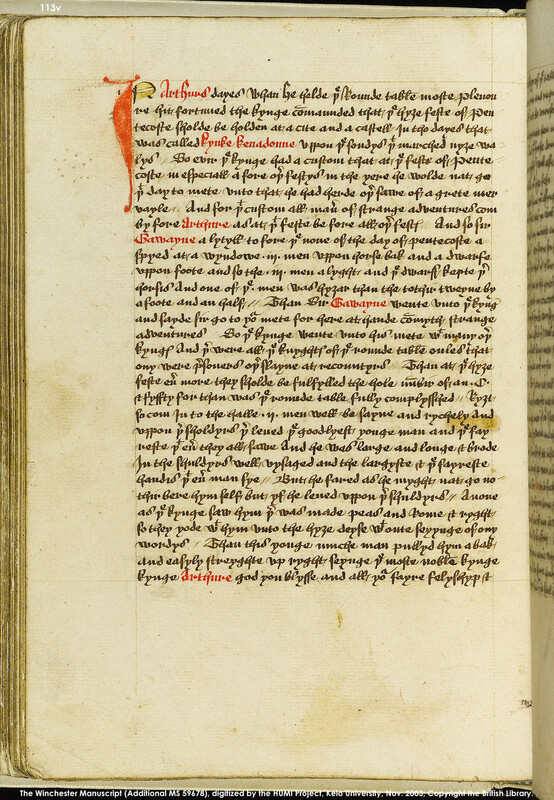 some sections start with initials in usual size, but they are separated from the previous sections with some blank lines (96r, 113v, 148v and 449r). These major divisions are also marked with explicits and incipits. 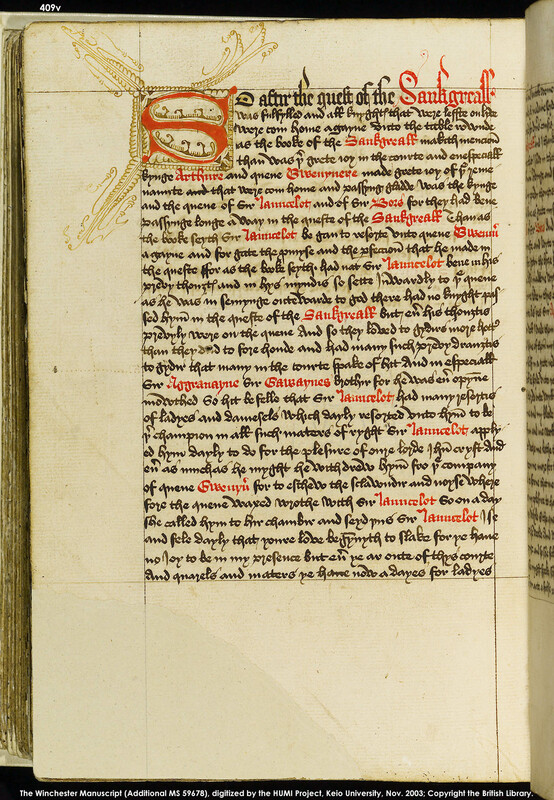 Caxton says in his Preface to the Morte Darthur that he divided the text into twenty-one books, and subdivided the books into chapters 'for to vnderstonde bryefly the contente of thys volume' (sig. π3v). He uses woodcut large initial letters to mark the beginnings of books and chapters, and gives books and chapter numbers at divisions. 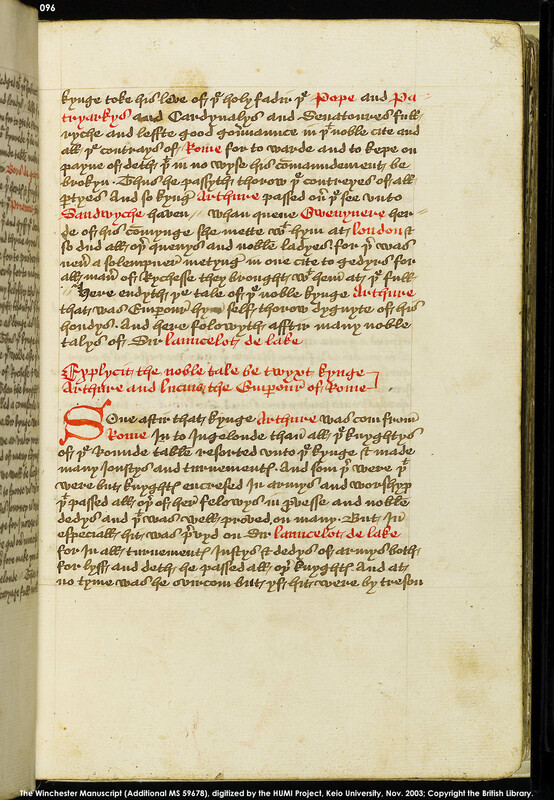 See for example, the beginning of Book V: sig. h7v.jpg; a typical chapter division, Chapter 2 in Book V: sig. h8r.jpg. There is also a Table of Contents at the end of the Preface. 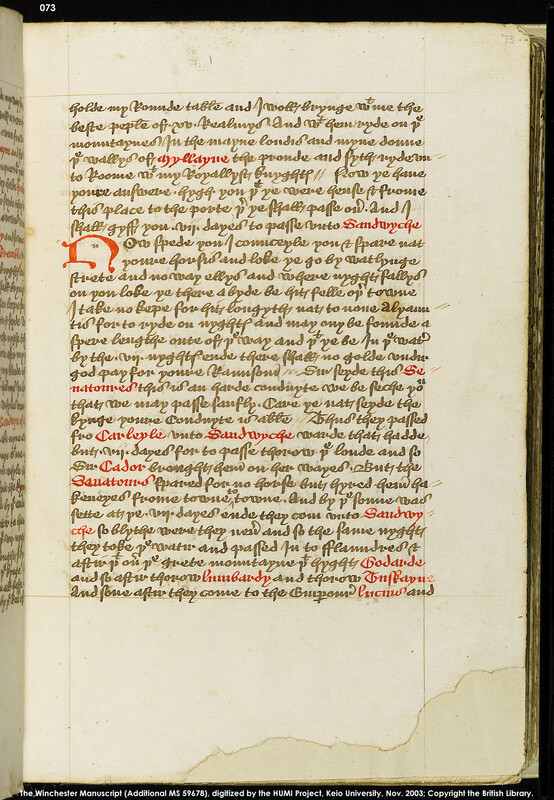 It seems that Caxton or a compiler went through the main text and compiled it after the text was printed (See Blake, 'Caxton Prepares his edition of the Morte Darthur'). Wynkyn de Worde, in his second edition of the Morte Darthur (1489), used Caxton's Table of Contents as the headings for the individual chapters. 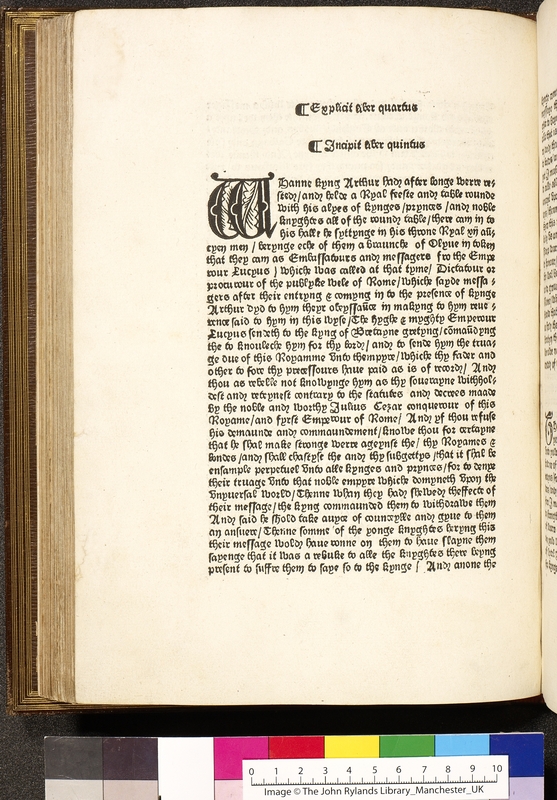 This system developed by de Worde was employed in all the later editions to this day. Eugène Vinaver's Works of Sir Thomas Malory, the first edition of the Morte Darthur based on Winchester (1947), argues that the explicits in Winchester, suppressed by Caxton, provided the sense of ending, and that Malory had written a series of eight separate romances, and not a single book presented by Caxton (Vinaver, Works, pp. xxxv-lvi). Vinaver divided the text into eight works and subdivided some of them into tales. Vinaver's theory of eight-separate romances has been discussed extensively by scholars (see for example Brewer, 1963; Lumiansky, ed., 1964; Riddy, 1987; Olefsky, 1969; Knight, 1969; Clough, 1986; Grimm, 1995), and now, there are probably very few scholars who would consider Malory's Morte Darthur as separate romances. Meanwhile, the system of eight major textual divisions established by Vinaver is widely accepted, and editors of Malory based on Winchester follow Vinaver's eight divisions (Cooper, ed., Shepherd, ed., Field, ed.). Where to divide the text further, however, is still a matter of dispute. The publication of the facsimile of the manuscript in 1976 let Malory scholars realise how the layout of the manuscript differed from that of Vinaver's Works. See, for example, Evans, 1979; Meale, 1996; Cooper, 2000. Vinaver did not regard many textual divisions in Winchester as authorial, probably because they do not always correspond with what Malory says. 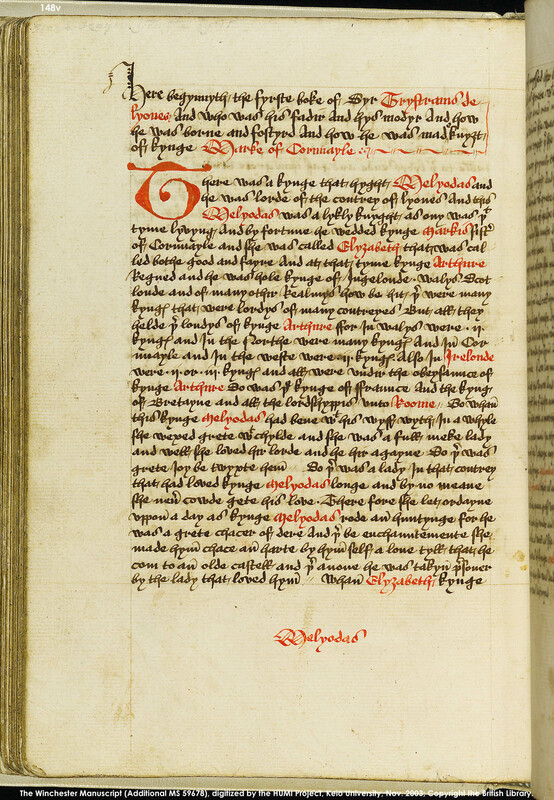 Out of 111 colours initials in the manuscript, only twenty-six were used by Vinaver for his own work or further tale divisions; seventy-seven of them were signalled by paragraph breaks, five by periods, and three by commas. On the other hand, Vinaver introduced 14 tale divisions without any supporting evidence from the manuscript. For the navigation purposes of the text in Winchester, the current project follows Vinaver's major divisions, and divides the text in Winchester in eight major sections. We then divided the text in Winchester further according to the large initial letters in Winchester. 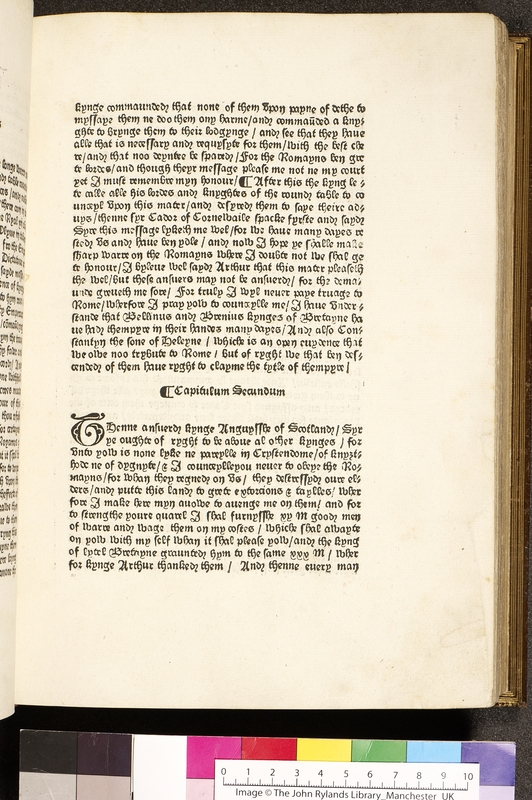 The text in the Caxton is divided according to his Book and Chapter divisions. Display the texts in the 'Full Text' mode, and use 'Div Tools' in order to navigate through the texts according to their textual divisions. 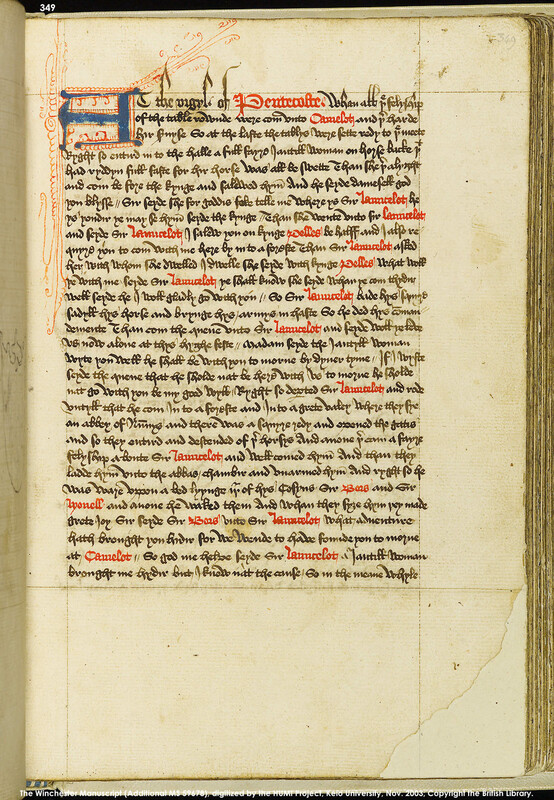 'Textual Options' panels in both the Winchester and Caxton texts provide functions, which allow users to navigate through the transcriptions according to the textual divisions in Winchester, the Caxton and Vinaver's Works.